An attempt to encroach on the Dahshur archaeological site was thwarted by the Egyptian Ministry of State for Antiquities (MSA) in collaboration with the Military Police (MP) and police. MSA Minister Mohamed Ibrahim tells Ahram Online that four people tried to invade the archaeological site of Dahshur with digging tools to build a graveyard for their family's, corpses but the MSA guards, in collaboration with the MP's, police and soldiers succeeded in stopping them and have arrested one. Meanwhile police forces are on the hunt to arrest the other three, who are now at large. Dahshur is a royal necropolis located in the desert on the west bank of the Nile almost 40 kilometres south of Cairo. 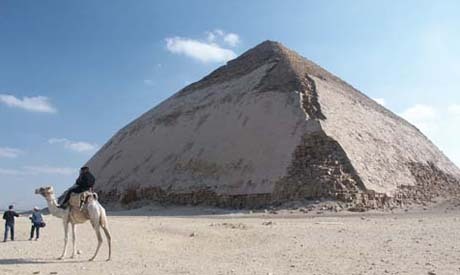 It is known for its several pyramids. Two of those pyramids belong to King Senefru, the founder of the 4th Dynasty and father of King Khufu, along with other pyramids and tombs of the Middle Kingdom, including the Black Pyramid of Amenemhat III and the White Pyramid of Amenemhat II. The area also has a 600 acre lake of King Farouq, which attracts a variety of bird species from all over the world in September. Seven months ago, the archaeological zone adjacent to the Black Pyramid of king Amenhotep III in Dahshur, an armed gang allegedly from Ezbet Dahshur broke into the area and built a collection of private cemeteries. Following several negotiations the MSA provided Ezbet Dahshur residents a neighbouring area far from the archaeological site to build their cemeteries so they would leave the archaeological zone. It seems, however, that these attempts have not yet stop and vandals always abuse the lack of security and current political events over Egypt to highjack archaeological sites and loot its treasured collection hidden in sand.